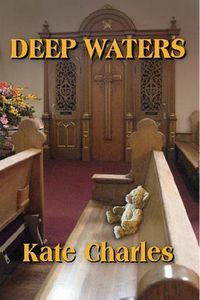 Deep Waters by Kate Charles: Synopsis and Online Purchase Options. Synopsis (from the publisher): In a culture obsessed with celebrity, baby Muffin's death is big news. Crib death? Or something more sinister? Everyone wants to know, including the police. Whatever the truth, the bereaved parents — celebrity couple Jodee and Chazz — live in curate Callie Anson's London parish, and Callie becomes involved with funeral arrangements, despite the disapproval of her vicar and his wife. Detective Inspector Neville Stewart is recalled from his honeymoon to investigate the case — with disastrous personal results. And journalist Lilith Noone's professional future is on the line, as she is sucked more and more deeply into her own flirtation with celebrity culture. Meanwhile, for police family liaison officer Mark Lombardi, the death of baby Muffin is eclipsed by another death, much closer to home, and he finds himself in an impossible position, torn between his loyalty to his family and his growing love for Callie.